At the request of our readers, we provide select “Deals of the Week”. Every Monday morning we offer our Best Bargain selections. Here are some of the best deals on firearms, hardware, reloading components, optics, and shooting accessories. Be aware that sale prices are subject to change, and once clearance inventory is sold, it’s gone for good. You snooze you lose. If you want to win, and want brass that lasts, think Lapua. Over 90% of all modern benchrest records have been set with Lapua brass. What’s more, Lapua makes outstanding bullets. Lapua Scenars have delivered superb accuracy in our site’s benchrest and tactical rifles. As for factory ammo, again Lapua is hard to beat. We got our hands on some Lapua 90gr 6mmBR factory ammo a few seasons back. That stuff was amazing. It delivered honest 5-shot, quarter-MOA groups! If you want these superior Lapua products, now is a great time to buy. Grafs.com is running a giant sale on all Lapua-brand products, including brass, bullets, and loaded ammo. You’ll save at least 10% on everything, with many items 20-24% off, and select loaded ammo up to 59% off. Lapua 6.5 Creedmoor SR brass is discounted 22%, a great deal. Plus, if you spend $250 or more you’ll get a free box of Lapua Center-X. Get a Ruger Precision Rifle in 6mm Creedmoor for $788.00 complete. That price, which includes rings, is great for a Gen 2 model. If you’ve been thinking of purchasing a Ruger Precision Rifle (RPR) chambered for the 6mm Creedmoor cartridge, this is a killer deal. Right now GunPrimer.com is offering this popular tactical rig for under $800.00, in the 6mm Creedmoor chambering. This shoots faster and flatter than the 6.5 Creedmoor — so many PRS guys have switched to it. This is a good choice for the PRS production class, or you can take in to another level of performance with a Pre-Fit 26″ cut-rifled barrel from Krieger. This is the lastest RPR Gen 2 version with the upgraded handguards. Heck of a bargain boys — you can pay $1200 or more elsewhere for the same rifle. Reloading information is interchangeable with 6.5mm Nosler Custom Competition bullets with the same grain weight. NOTE: These Match Monster Bullets are NOT BLEMS! AMAZING DEAL — save $390.00! Other vendors sell this very same Razor HD spotter for $1199. Here’s a great deal on a high-quality spotting scope from a top optics maker. AL’s Sporting Goods has last year’s model Vortex Razor 20-60x85mm spotter for only $899.99, including eyepiece. This impressive HD-glass spotter sells elsewhere for $1200.00. But it gets better — use Code ALS10 for another 10% Off, bringing the final price down to $809.99. This is a very good spotter for the money and Vortex has one of the best warranties in the business. H4895, Varget, H4350 — these are all great powders for competition cartridges such as the 6mmBR Norma, 6 Dasher, 6.5 Creemoor, and .284 Shehane. Because these powders work so well, they can be hard to find. Right now Powder Valley has a great supply of these and other excellent Hodgdon powders (such as H4198 and H4831sc) in both 1-lb and 8-lb containers. For example H4350 and Varget are $27.35 for 1-pounders, while H4895 and H4198 are just $26.35 for a 1-lb bottle. An 8-lb jug of H4350 is $194.50, a lot less than you’d pay in most retail stores. Everyone should own a nice .22 LR rimfire pistol. The Browning Buck Mark is a classic, and for good reason. These pistols are reliable, well-balanced, have a good trigger, and they are very accurate. We have nothing but praise for the bull-barreled Buck Marks. And now you can get one for a super-low price. Sportsman’s Guide has the Browning Buck Mark Camper UFX with 5.5″ Barrel on sale for $299.99 ($284.99 member price). But it gets even better — if you use Code “WARRIOR” during check-out, you save $20.00, putting your total price at just $279.99 (or $264.99 for SG members). That’s a great deal on a very solid rimfire pistol that can serve you well for decades. Here’s a good deal on a versatile Stocky’s Long Range Stock with aluminum V-block bedding system. For just $199.99, order this for Rem/Rem Clone long actions or short actions, with either narrow or wide (varmint/tactical) barrel channel. This would be a good choice for a varmint rifle. This is also offered with handsome hydrographic or web-pattern baked-on textured finishes for $219.99. All serious rifle shooters need a scope level. This nicely designed Jialitte Scope Bubble Level features a 30mm milled inside diameter, plus an inner insert ring so it will also fit 1″-diameter main tubes — that dual-diameter versatility is a nice feature. We also like the way the unit is nicely radiused, and has a low profile in the middle. Price is just $10.99 with free shipping. User reviews have been very positive. You could easily pay $35.00 or more for a 30mm scope level. Purchasers have praised this product — nearly all verified buyers rated this five stars. Share the post "Bargain Finder 176: AccurateShooter’s Deals of the Week"
Everything you see above can be yours for just $279.99. Great Deal. Right now, Natchez is selling the Rock Chucker Supreme Master Reloading Kit for $279.99, a great price considering all the hardware you get: Press, Primer Tool, Scale, Powder Measure, Loading Tray, Reloading Manual and more. Heck, the Rock Chucker press alone is worth $160.00+. This is good starter kit for any reloader with sturdy items (like the Rock Chucker press), that will last a lifetime. Here’s a very attractive promotion if you need powder and/or primers. Right now Natchez is offering FREE HazMat for orders of $99.99 or more. This can save you $25-$40 on the delivered cost of your order. NOTE: Act soon — this deal expires 9/26/2018 at 11:59 PM and you must use CODE FH180924. Credit EdLongrange for this tip. He notes: “Natchez … was somewhat vague as to whether you need to get $99.99 of the same product, so I added one each of two different primers and two different powders and the code worked. Natchez has … excellent prices on Federal Gold Medal Match primers, including what used to be really-hard-to-get GM215M.” ORDER HERE. The Howa 1500 Full-Dip Kryptek rifle is purpose-built for hunters who want a full matching camo rifle and scope. This .308 Winchester rig features a pillar-bedded Howa action with 20″ barrel in a quality Hogue stock. On top is a Nikko 4-16x44mm scope with one-inch tube. The entire rifle and scope features a hydro-dipped Kryptek Highlander camo finish which is handsome AND very effective in the field. NOTE: The current Sale Price is $662.99. Use CODE M8Y to save $10 and get FREE Shipping. That lowers your delivered price to $652.99, which includes the Nikko 4-16X scope. All-up weight, with scope, is 10 pounds. Sorry this deal is not currently available in other chamberings — .308 Win only. We’ve checked out the Nikon Black X1000 series scopes and they offer a lot of performance for the price. On sale now at Amazon for just $599.99 is the second focal plane (SFP) BLACK X1000 6-24x50mm model with X-MOA reticle. A Mil version with 0.1 Mil click and X-MRAD reticle is also available for $646.99. These scopes have very crisp controls and great glass for the money. The MOA version 1/4-MOA click with 12 MOA per revolution and 60 total MOA internal adjustment. The Mil version has 0.1 MilRad clicks with 17 total MRAD internal adjustment travel. On both versions, a side-mounted control offer 10 intensity levels of red illumination. Currently, CDNN is running a great Holster Liquidation Sale. Every holster in stock is just $19.99, including some models that normally retail for over $85.00. Chose from quality polymer holsters or traditional leather holsters from Mitch Rosen. Many of these holsters are designed for Sig Sauer pistols, but there are holsters for other popular pistol brands as well. This Plano Double Scoped Rifle Case is an Amazon Best Seller for good reason. It offers the functionality and durability of an SKB-type hard case for HALF the money. This is under $110.00, while the equivalent SKB is around $240.00, so you can buy two Planos for the price of one SKB. The 51.5″ interior will fit most scoped competition rifles up to about 29″ barrels (measure your own rifle to make sure). If you separate the barreled action from the stock you can transport even ultra-long ELR rifles. The handles are convenient and beefy and the wheels make this case easy to move. This is a very tough, roomy case for the money (plus there’s Free Shipping). The Hornady Lock N Load Auto Charge Electronic Scale/Dispenser is now on sale for just $158.99 at Midsouth Shooters Supply, discounted way down from the regular $226.24 price. That’s the lowest price we’ve seen on this product in a long time, making this a real bargain. If you are looking for an affordable combination digital scale and powder dispenser, this is very attractive pricing. By comparison, the new RCBS ChargeMaster Lite sells for around $250.00 and is back-ordered at most vendors. That means you can save at least $90.00 by buying RED instead of GREEN. Even if you have a good set of calipers, you may want to get one of these Neiko 01407A Digital Calipers. The #1 best-selling digital caliper on Amazon.com, this Neiko tool features a large LCD Screen and measures up to 6.0 inches. With over 3000 customer reviews, this product has earned an overall rating of 4.4 out of 5 stars. It’s hard to go wrong for $16.85, even if you just use these as a spare set for measuring group sizes and case trim lengths. Share the post "Bargain Finder 157: AccurateShooter’s Deals of the Week"
Brownells hase been running a huge Labor Day Week Sale. Enjoy savings up to 53% now through Monday, September 3 at 11:59 CT. There are big discounts on products we really like including: Howa Barreled Actions, SIG Sauer Pistols, Lake City Ammo, Smith & Wesson Revolvers, and AR components. You may want to jump on these bargains, as inventory is limited on some items, such as the Howa Barreled Actions. Get a new Tikka for your fall hunt. These fine hunting rifles are now available with huge discounts. EuroOptic.com bought a truckload of Tikka T3 rifles from the North American distributor. Now these T3s are being offered at huge discounts –some below wholesale cost. Tikka rifles that typically retail for $600 to $1000 are selling for $359 to $600. Save hundreds! Look no further if you if you want a very high-quality hunting rifle at a rock-bottom price. Celebrate Labor Day with big savings. Bullets, brass, powder, optics, dies, tools, stocks, barrels, actions — all this and more are on sale at Bruno Shooters Supply right now. You’ll find savings on pretty much everything Bruno’s sells (except MAP-price items). But you have to act quickly. This storewide sale ends soon so you don’t want to delay. NOTE: You don’t need a special discount code — the sale prices are already shown online. No Back-orders with sale pricing. Natchez has many items on sale this weekend, plus three (3) Promo Codes. Use CODE PO180831 to save 10% right off the price. Or, for heavy shipments, try CODE FR180831 — this provides $5.00 flat-rate shipping on orders over $99.99. If you need powder and/or primers, select CODE FH180831. This waives the HazMat fees for powder and primer orders over $150.00. Pick the Code that works best for you. Don’t hesitate — this deal expires 8/3/2018 at 11:59 pm CST. The Witt Machine’s Labor Day Sale is easy to understand — save a full 25% on all items featured on the WittMachine.net home page. This includes clamp-on and screw-on muzzle brakes, suppressors, muzzle rise eliminators, plus integrally suppressed rifles and suppressed AR uppers. CLICK HERE for all sale items in stock. Witt sale tip from EdLongRange. This year, MidwayUSA’s 7th Annual Camo Tuesday™ will feature deep discounts on select MidwayUSA hunting clothing, footwear, ammunition, optics and more from brands like Irish Setter, Federal, and Vortex just to name a few. “Camo Tuesday [is] Black Friday for the hunter and marks the first official shopping day of the fall hunting season,” said Jeff Larkin, VP Marketing. “This year’s Camo Tuesday event … will be bigger and better than ever.” Head over to MidwayUSA.com on September 4th to take advantage of the great deals. You can also enter the 2018 Camo Tuesday Sweepstakes with prize package worth $750.00. To celebrate the long, Labor Day weekend, Creedmoor Sports is offering FREE Ground Shipping on most items in inventory. This applies to normal ground shipping rates, but not HazMat charges, so you’ll still have to pay HazMat for primers and powder. The Free Shipping will be automatically applied to Labor Day orders — no Code needed. Some exclusions apply (HAGAR brass, tumbler media, Sierra bullets, portable air gun ranges, primers). Drop-shipped items (e.g. Giraud and Gracey products) exempt. Here’s a smart product at a great price. Amazon is selling a 9.5″ x 6″ lock box disguised as a hard-cover dictionary for just $9.41. That’s a great deal — 53% off Amazon’s normal price. Use this book safe to secure valuables, such as car keys, spare cash, or watches. We still recommend a secure gun safe for firearms, but this Lock Box definitely comes in handy for smaller items, such as currency and keys. This $9.41 deal won’t last long. These “hidden in plain sight” book safes sell for up to $35 elsewhere. Share the post "Bargain Finder 154: AccurateShooter’s Deals of the Week"
Today, 28 May, 2018 is Memorial Day — the important day when we honor those military personnel who have died serving their nation. We urge all of our readers to respect this solemn occasion and remember those who “sacrificed all” to safeguard your freedom. To mark this holiday, many vendors are running Memorial Day Sales. We spotlight some of these end-of-May promotions. Be aware that Memorial Day Sales are typically short-lived — quite a few of these sales conclude at 11:59 pm on Monday May 28th, or a day later — Tuesday May 29th. A few sales end Tuesday at noon. If you want these deals — act now. Natchez Shooters Supplies typically offers some of the best prices on reloading tools and optics. Now those deals are even better as Natchez has knocked 10% off the price of virtually every item in stock. Use Code PO180526 to get these savings. But hurry — sale ends 5/28/2018 at 11:59 pm CT.
Bruno Shooters Supply runs a big sale each year during Memorial Day weekend. Lots of premium items are discounted: BAT Actions, Krieger Barrels, Berger Bullets, Lapua components, Nosler Bullets, Redding Dies and more. There are also discounts on primers and powders. CLICK HERE to see all the Sale Items. You’ll want to act quickly, as Bruno’s Sale ends Tuesday, 5/29/2018 at 12:00 noon Mountain Time. That’s a mid-day cut-off on the 29th! As part of its Upgrade Summer Sale, Brownells is offering Free Ground Shipping ($49+) and Free Second-Day Shipping ($99+). Scores of popular items are on sale now through 11:59 PM on May 28, 2018: Leupold Scopes, Aero Precision Uppers and Lowers, Lake City Ammo, Federal Ammo, Remington Shotguns, Smith & Wesson pistols, MagPul magazines, and much more. Large retailer MidwayUSA offered free shipping for Memorial Day Weekend. Now MidwayUSA is running a money off promotion through 5/31/2018. While some exclusions apply, this applies to most regularly-priced, in-stock items (not sale or clearance items). Here’s how it works, use code 10MAY18 during check-out to save $10 off $100+, use code 20MAY18 to save $20 off 200+, or use code 30MAY18 to save $30 off $300 or more. Note, this special ends 5/31/2018 at 11:59 pm CT. Precision Reloading has a pretty straight-forward promo for Memorial Day. You can get $10 off any order of $100 or more with Code 10M18, OR get $30 off any order of $300 or more with Code 30M18. That’s 10% saved right off the top. But act soon — this offer expires May 28 at 11:59 pm CST. Right now you can save 10% off scores of products at Optics Planets. Of course this includes Riflescopes, Rangefinders, and Spotting Scopes, but Optics Planets carries many other products of interest to shooters and hunters. Use Code MEMWK to save 10% off all qualifying Sale Items. NOTE: This offer expires May 28 at 11:59 pm CST. Optics Planet Sale Tip courtesy EdLongRange. Creedmoor Sports is running an attractive promotion for Memorial Day. First you can get Free Ground Shipping on orders $49.00 or more. In addition many items are 10% off. For example Lapua and SK rimfire ammo is 10% off now. NOTE: This is a limited time offer. Some exclusions apply. Drop-shipped items exempt. Here’s a good deal on a versatile Stocky’s Long Range Stock with aluminum V-block bedding system. For just $179.99, order this for Rem/Rem Clone long actions or short actions, with either narrow or wide (varmint/tactical) barrel channel. This would be a good choice for a varmint rifle. This is also offered with handsome hydrographic or web-pattern baked-on textured finishes for $199.99. Share the post "BargainFinder 140: AccurateShooter’s Deals of the Week"
Here’s a good deal on a versatile Stocky’s Long Range Stock with aluminum V-block bedding system. For just $179.99 (unpainted), order this for Rem/Rem Clone long actions or short actions, with either narrow or wide (varmint/tactical) barrel channel. This would be a good choice for a varmint rifle. This is also offered with handsome hydrographic or web-pattern baked-on textured finishes for $199.99. No personal rifle collection is complete without a .50 BMG — the big boy. The single-shot, bolt-action Noreen is one of the most affordable Fifties. This 32-pound beast boasts a 34″ barrel with a massive muzzle brake. The Noreen’s bolt is stout, sporting a large diameter bolt body. This jumbo-sized rifle comes with Timney trigger and AR-type pistol grip (which can be exchanged by purchaser). The wide bipod is included with the rifle. CDNN now offers the Noreen .50 BMG in either Matte Black or Desert Camo for the same $2049.99 price. You can also purchase this rig directly from Noreen Firearms, with a choice of four calibers: .338 Lapua Magnum, .408 CheyTac, .416 Barrett, and .50 BMG. This is a very impressive new resource book, which we perused at length at SHOT Show. We were very impressed. Western’s new Reloading Manual is richly illustrated, with large clear diagrams, and hundreds of color photos. There are many well-written, informative articles on reloading tasks by knowledgeable experts. The reloading data tables are easier to read than most other reloading manuals. The “how-to” section of this new reloading manual is probably the best we’ve seen in terms of layout and organization. Western has a real winner here in our opinion. With up-to-date info on modern cartridges, it is a great combination of Numbers (load data) and Knowledge (how-to articles) for users of Western powders. Leica has long been a leader in the Laser RangeFinder market and the model CRF 2000-B is highly regarded among hunters. Now you can get this popular model for just $559.00 at EuroOptic.com, a very good value ($69 cheaper than Amazon). And, when you buy from EuroOptic you’ll get a $100.00 gift card. This lowers your effective price to just $459.00 — a heck of a deal for the “gold standard” in super compact laser rangefinders. The Leica 2000-B is small enough to carry in your pocket. Sometimes less is more. In this case, if you are looking for a good basic zoom optic for a varmint rifle, the 6-24x42mm Weaver fits the bill. You have plenty of power to see small varmints at long range. The 1″ tube allows you to fit less expensive rings. The front objective parallax is more fool-proof than many side-focus systems. And the Ballistic-X reticle gives you multiple hold points — helpful when you are moving near to far and back again in a P-Dog field. At $259.99 this is an exceptional bargain. We wouldn’t hesitate to run this scope on a varmint rig. We’ve always liked Lyman’s Case Prep Express. It has five powered stations, allowing you to do all important case prep operations: Primer Pocket Cleaning, Primer Pocket Uniforming, Inside Chamfering, Outside Chamfering, Inside Neck Cleaning. The unit is easy to clean, with a removable tray to hold brass shavings. Brownells has the Case Prep Express on sale now for $94.99. Very good price — that’s $24 cheaper than Amazon. Plus Brownells is now offering free shipping with Checkout CODE M7R. This Norma Match-22 ammunition is good stuff. In many rifles it shoots as well as $8/box products from other makers. But now you can get Match-22 for the equivalent of $4 per 50-ct box when you buy 500 rounds. MidwayUSA is selling a 500-round case (10 boxes) of Norma Match-22 for just $39.99. That works out to just 8 cents per round. Or you can get 1500 rounds (three 500-round cases) plus an ammo can for just $124.99. We think you’ll be happy with this ammo. It is a good choice for tactical cross-training, rimfire silhouette, and fun shooting. Every ranch, farm, or household can use a defensive 12 Gauge shotgun. We like ghost ring sights on our self-defense scatterguns, and this Stevens 320 Security model has that feature. This shotgun is a steal — get one now for the amazingly low price of $179.99 ($170.99 Buyer’s Club price). You won’t find a quality, American-made, ghost-ring 12 gauge pump for less money. At this price you can afford to buy two or three. This Stevens 320 Security shotgun is made by Savage Arms. We like reactive targets. It’s fun to “ring steel” and see a target move instantly when hit. For just twenty bucks (including shipping), it’s hard to go wrong with this 8″ AR500 Steel Gong. The 8″-diameter size is big enough for zeroing at 200 yards, yet offers a nice challenge at 500 yards and beyond. There is also a 6″-diameter model for just $14.00. Share the post "Bargain Finder 123: AccurateShooter’s Deals of the Week"
Only four shopping days left until Christmas. Thankfully, many vendors, including Amazon, offer expedited shipping. In addition, many leading shooting sports online merchants are offering Free shipping promotions right now. Here’s a quick summary of Five FREE Shipping offers, four of which require a minimum purchase. Bruno’s is offering FREE Shipping on all orders over $99.95 with some exclusions (such as rests and gunsmith work). In addition you can get FREE Shipping and FREE Hazmat with orders of powder and primers that total $500.00 or more. These two offers are good through 12/26/2017 at 8:00 am MST. Cabela’s is offering FREE shipping on all orders of at least $99.00. What’s great is that this free shipping offer runs all the way through January 2, 2018 — so it applies to post-Xmas shopping too. There are some exlusions but this a still a very good offer that applies to nearly everything Cabelas sells. To get Free ground shipping use Promo Code 2017FREE during checkout. Creedmoor Sports is now offering FREE Ground Shipping on all orders over $99.00. Some exclusions apply. Right now Creedmoor is also offering a huge Holiday Sale right now with big discounts on popular products including rifle cases, shooting coats, target cams, Books/DVDs, and much more. We just order a Service Rifle Scope and some other accessories and got FREE Shipping on the entire order. MidwayUSA is offering FREE shipping (no minimum) on 18 popular brands including six leading optics makers. Along with free shipping on scopes you can get free shipping on Sitka, Danner, 5.11, and Carhartt outerwear and clothing. Natchez is offering FREE Ground Shipping on all orders over $49.99 — that’s generous compared to other vendors who want you to spend $99 or more to get free shipping. This applies to pretty much everything in stock other than Motor Freight and Drop Ship Items. Use Promo Code FS171221 during check out. But you better act soon — this offer expires 12/24/17 at 11:59 pm EST. Offer Details HERE. Share the post "Five Holiday Free Shipping Offers"
This is a heck of a deal. Fine action, great stock, really great price. For comparison, Savage sells its similar 6.5 Creedmoor Model 10 GRS for $1449.00 MSRP (street price $1250.00). Frankly, we prefer the Howa 1500 action and trigger, though we like the versatility of the Savage barrel nut system. Hard to go wrong here with Bud’s Gun Shop’s $772.00 price. That’s for payment via money orders, checks, or echecks; credit card price is $795.16. Get $772.00 price HERE. Rifleshooter.com published a FULL REVIEW of this rifle: “Precise — The Howa GRS was capable of sub-MOA 5-shot accuracy out of the box. Value — The street price on these guns is well below the cost of a custom rifle. This would be a great entry-level gun. Stock — The length-of-pull and cheek-piece adjustments on the GRS were fantastic. Stock was extremely comfortable in alternate positions.” READ Rifleshooter.com REVIEW HERE. Everyone should have a good .22 LR rimfire pistol. As an owner of a Sig P226 (9mm), this Editor smiled when I saw this German-made rimfire pistol. A virtual clone of Sig’s full-size P-series pistols, this polymer-framed rimfire gun offers excellent ergonomics. Priced at just $199.99 at Sportsman’s Guide, this GSG lets you practice your handgunning with low-cost .22 LR ammo. This suppressor-ready GSG FireFly features a 4″ barrel with threaded muzzle. Shown is the handsome Flat-Dark-Earth (Tan) finish. The same GSG is also offered in a matte black and olive drab finishes, but we like the tan best. Very nice offering for under $200.00. NOTE: Though this looks like an aluminum-framed Sig, the frame is polymer, like a Glock or HK. We said this was a good deal when priced around $135.00. Well now the Rock Chucker is just $112.49 at Amazon — matching the lowest price we’ve seen in years. The RCBS Rock Chucker remains a classic — a big, strong, versatile press that can handle most reloading chores with ease. And now you can get a genuine Rock Chucker Supreme for $112.49 — an insanely great deal. The Rock Chucker offers plenty of leverage for case-sizing and the “O” is tall enough for long cartridges. The Rock Chucker has a very strong base and should last a lifetime. Natchez Shooters Supplies is running a big sale on Leupold VX-6 scopes. You can save hundreds of dollars on a wide variety of VX-6 optics, from 1-6x24mm up to 3-18x50mm models. If you are looking for a high-quality hunting optic at a great price check out these deals. For example, Leupold’s 2-12x42mm FireDot (Illum.) Duplex VX-6 scope is marked down from $1199.99 to just $749.99 — a $450.00 savings! Shown above are four hot deals, but a dozen Leupold VX-6 models on are sale now. Natchez has obtained a supply of British MOD Surplus SKB 5041 rifle cases. These were ordered as mine detector cases, but were never issued. Natchez has removed the foam cut for the detectors and replaced it with new 2-piece convoluted foam. Interior dimension of the case is 50″x14.5″x5″ so this will hold long-barrel match rifles comfortably. These are extremely high-quality cases, very tough and rugged, waterproof with gaskets. These cases feature four SKB patented trigger latches, four reinforced padlock locations, and inline wheels. Though in excellent condition, some case may have minor exterior scuffs. You won’t find a better case at anywhere near the price. These normally retail for $299.99. Pro Precision Rifles (PPR) is having a big sale during the month of October for bolt knob installations and bolt fluting on Remington bolts. During this promo you can get a bolt fluted for just $50.00. Likewise, installing a custom bolt knob is just $50.00. That’s one-third off both services. Bolt fluting is normally $75.00 as is bolt knob installation. So you can save $25.00 with either service. Your final price is $50.00 for each service + $7.50 return shipping (or $12.00 SH with insurance). PPR’s owner tells us: “This pricing includes all my knobs, including the Two-Tone, that usually runs $10.00 more due to the extra machining required. Coated knob or polished knobs are no additional charge”. If you guys want to add a cool custom touch to your favorite bolt-gun, take advantaged of this October special by visiting www.boltfluting.com. Guys, here’s just what you need (maybe) to convince the significant other to join you for a day at the range — a combo set of “high-fashion” ear muffs and ANSI-rated safety glasses. The comfortable, zebra-print muffs provide 21 dB of noise reduction (we recommend running plugs underneath them). The stylish, tortoise-shell pattern Bella Ballistica™ shooting eyewear has passed MIL-PRF-31013 ballistic tests and meets ANSI Z87+ high-velocity requirements with a chic designer appearance. The lady in your life just might appreciate the stylish eyewear and distinctive muffs, earning you “bonus points”. And she’ll never suspect you only spent seven bucks! Here’s an excellent product from one of the most prestigious names in the Optics industry. You’ll be amazed at the quality of this product for the low $258.12 price. Honestly you’d expect to pay three times as much for a product like this, which has received five stars from 60% of verified buyers. Today’s selling price is a full 40% off the original third-party sale price. If you have a new hunting rifle build in progress, this could be exactly what you need to top off your new deer-slayer. CLICK HERE to view the Mystery Deal of the Week. Share the post "Bargain Finder 106: AccurateShooter’s Deals of the Week"
EuroOptic.com is running a special sale this week on a wide selection of Vortex products, including some of the most popular competition scopes, such as the 15-60x52mm Golden Eagle. CLICK HERE to see all the deals. Do your own comparison shopping. You’ll see Eurooptic’s prices are excellent — you can save hundreds on some models. There are over 80 Vortex products on sale, including comp scopes, hunting scopes, tactical scopes, red dots, spotting scopes, and laser rangefinders. These 34 dB NRR earmuffs provide excellent sound protection without being too heavy and bulky. At at $17.45, they are a great bargain. The lower section of the muff is trimmed for a narrower profile — that helps with rifle and shotgun stocks. The headband is adjustable and has comfortable padding. These Pro For Sho Muffs have earned a 4 1/2 star consumer rating, with over 1,600 Amazon customer reviews. NOTE: These fit pretty tight. If you have a very large hat size you might want a different brand. Rebate Ends August 31, 2017! With Lyman’s Summer Rebate, you can now get $25.00 Off five of Lyman’s top-selling products: BoreCam, Case Prep Xpress, Gen6 Powder Dispenser, Cyclone Rotary Tumbler, and AutoAdvance Target. With Lyman’s Summer Mail-In Rebate Program, you can earn a $25 rebate per select item bought from any Lyman dealer, online or direct from the Lyman website. Items must be purchased no later than August 31, 2017 to qualify. CLICK HERE for the Rebate Redemption Form. Looking for a great holiday gift for a family member getting started in metallic cartridge reloading? This RCBS Kit has everything a new reloader needs: single-stage press, powder measure, scale, powder trickler, priming tool, cartridge tray, “rocket” chamfer tool, case lube and more. This is an excellent entry-level reloading kit, on sale for just $199.99 at Natchez Shooters Supplies. We like the relatively compact Special 5 press for most reloading duties. Eventually you may want to add an additional, large heavy press, but this will get the job done. For the combined package, with all the tools one needs to hand-load quality ammo — this is a stunningly good deal at $199.99. Benchrest Matches have been won (and many records set) with 36X Weaver T-Series optics. Our friend Boyd Allen observed “You can pay three or four times as much for a scope but not necessarily be more competitive — a 36X front objective Weaver is enough to win with…” The Classic T-Series Weaver has proven to be one of the most reliable high-magnification scopes ever made. The “old-fashioned” adjustable objective works well and the Weaver Micro-Trac turret system delivers precise and repeatable elevation and windage control. You can also save money on rings since the main tube is 1″ diameter. The Weaver T-36 with 1/8 MOA clicks and Target Dot reticle costs $449.95 at Amazon.com with free Prime Shipping. This versatile funnel system works with nearly all cartridge types, from 17 Remington up to 500 S&W. Even if you have a fancy metal funnel, it’s worth having one of these RCBS Kits on your reloading bench. The RCBS Quick Change Powder Funnel Kit features five (5) adapters that match case mouth diameter for specific cartridge ranges: 17-20 caliber, 22-264 caliber, 27-284 caliber, 30-375 caliber, 40 caliber and higher. The Funnel Kit includes a handy 4-inch drop tube. Price is $9.99 at Amazon with free shipping on orders over $25 total. Here’s a great Rebate offer from Federal Premium Ammunition. Now through August 31st, you can get 25% OFF the cost of Federal American Eagle brass-cased pistol ammo. We’ve used this ammo in .380 ACP, 9mm Luger, .40 S&W, and .45 ACP and we can say it’s good stuff — very reliable and cleaner that some other less-expensive brands. Midsouth Shooters Supply has qualifying American Eagle Ammo in a variety of calibers: .25 ACP, .380 ACP, 9mm Luger, .38 SPL, .357 SIG, .357 Magnum, 40 S&W, .44 Rem Magnum, .45 ACP. Midsouth’s American Eagle Ammo starts at $13.03 for 50 rounds of 9mm Luger. The 25% OFF Rebate reduces the price to just $9.77 per 50-ct box. CLICK HERE for Rebate Form. This Editor’s first really accurate handgun was a Smith & Wesson model 617 that could easily stack ten shots in a dime at 10 yards. It remains my favorite and most-used handgun, and I will never part with it. What can we say about the model 617? Every serious gun guy should own one. The single-action trigger pull is superb, and the accuracy surpasses most any semi-auto rimfire pistol, except for a few, very, very expensive target pistols. We like the 6″ version for the longer site radius, but the 4″-barrel 617 is also very accurate, and it balances better. CDNN’s $679.99 sale price may seem like a lot of money, but MSRP is $829.00 and most dealers are charging $750.00 or more for a new 6″-barrel 617. Get one — you won’t regret it. This patented Home Depot workbench assembles in a few minutes. Simply unfold the legs, pop in the shelf, and you are ready to start your project. Made from Premium 2×4 Hemlock fastened with glue and screws, this workbench is a great value. The bench (72″ wide x 35″ high x 22″ deep) can easily be stored when not in use. NOTE: The wood is unfinished (can be painted or stained). We use 1″-diameter Target Spots for sight-in and practice at 100-300 yards. These bright red/orange self-adhesive dots are easy to see. At 100 yards the high-contrast black diamond centers provide precise aiming points. We found this 10-pack of target spots on Amazon at a rock-bottom price. You get 630 total stick-on dots for just $9.65 with FREE Shipping. You can also get 360 Birchwood Casey 1″ dots from Midsouth for just $3.15, but shipping is extra. If you’re already ordering something from Midsouth, you may want to add the dots to your order. Share the post "Bargain Finder 101: AccurateShooter’s Deals of the Week"
At the request of our readers, we provide select “Deals of the Week”. Every Monday morning we offer our Best Bargain selections. Here are some of the best deals on firearms, hardware, reloading components, and shooting accessories. Be aware that sale prices are subject to change, and once clearance inventory is sold, it’s gone for good. You snooze you lose. We said this was a great deal last week at $126.99 — and now the Rock Chucker is just $112.49 at Amazon — the lowest price we’ve seen in years. The RCBS Rock Chucker remains a classic — a big, strong, versatile press that can handle most reloading chores with ease. And now you can get a genuine Rock Chucker Supreme for $112.59 — an insanely great deal. The Rock Chucker offers plenty of leverage for case-sizing and the “O” is tall enough for long cartridges. The Rock Chucker has a very strong base and should last a lifetime. We do recommend doing priming with a separate priming tool. This is an excellent entry-level reloading kit, which is on sale for $199.99 at Natchez Shooters Supplies. We like the relatively compact Special 5 press for most reloading duties. Eventually you many want to add an additional large heavy press, but this will get the job done. This kit includes an RCBS Powder Measure, Digital Scale, Powder Trickler, Hand Priming Tool, Load Manual, Loading Tray, and more. It’s hard to beat this combination of tools for under $200.00. Lapua Scenar-L bullets are superb. We have found these bullets to be extremely consistent in weight and base to ogive measurement. Scenar-L bullets also shoot great. We think serious shooters owe it to themselves to try a box of Scenar-Ls for their favorite match rifle. And now .224, 7mm (.284), and .308 caliber shooters have the opportunity to grab some great Scenar-Ls for an amazingly low price. Right now Grafs.com is running a SALE on select Scenar-Ls in .224, .284, and .308 calibers. These are priced 46% Off, saving you up to $26.00 per 100-count box! NOTE: The 180gr 7mm and 220gr .308 bullets are both outstanding choices for F-Class and long-range competition. Grab a Walther PPS M2 for under $300.00. This is a great little concealed carry pistol. You can run it with a flush mag for deep concealment or with an extended mag that provides a more comfortable grip (photo at right). This week, CDNN Sports is offering special sale pricing on the Walther PPS M2. Get $60 off regular the retail price. Combine that with Walther’s $100 manufacturer rebate, and you can get the PPS M2 for just $299.99. We do like this little pistol — it’s comfortable, accurate, and has a decent trigger. The PPS M2 is the carry choice of our System Administrator. READ PPS M2 Review. Bullets.com has a large selection of rifle, pistol, and shotgun ammunition on sale. You can get name-brand ammo at big savings right now. If you’re looking for factory pistol ammo you should definitely shop at Bullets.com this week. And there are even deals to be had on ultra-premium Lapua ammo — just about the best factory ammunition you can buy (at any price). Share the post "Bargain Finder 95: AccurateShooter’s Deals of the Week"
Natchez Shooters Supply boasts some of the best prices on the web for loaded ammunition, bullets, reloading gear, and optics. And now there’s even more incentive to shop at Natchez. Now through May 21, 2017, you can get FREE Shipping at Natchez for all orders of $100.00 or more. To get this FREE Shipping use Code FSB1705 during check-out, for orders placed through 11:59 pm EST on 5/21/17. As you’d expect, there is some fine print — Hazmat charges still apply for powder/primers, oversize charges still apply, and Gun Safes and certain other large/heavy products are excluded. But this is still a very attractive offer, that could easily save you $15-$30 on a typical order. Above are some of the best deals available at Natchez right now. If you need loaded pistol and rimfire ammo this is a great source. Also the surplus SKB case less than half the price of what a case of this quality normally costs. With inside dimensions of 50″ x 14.5″ x 5″, it is big enough for most match rifles. 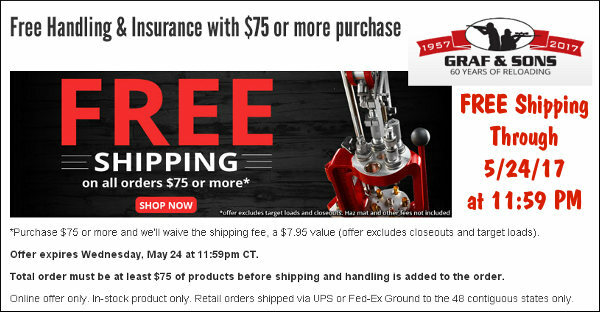 Graf & Sons, one of our favorite retailers, is running a FREE shipping promo too. Grafs has competitive pricing, a great selection of Lapua brass and premium projectiles, plus top-flight reloading gear, such as the AMP Annealer. Now through May 24, 2017 you can get FREE Shipping with orders of $75.00 or more. This way Grafs.com waives its normal regular $7.95 handling fee. As you’d expect, Hazmat fees and oversize charges still apply and close-out items are excluded. CLICK HERE for details. Share the post "FREE Shipping Promos at Natchez and Graf & Sons"
At the request of our readers, we provide select “Deals of the Week”. Every Monday morning we offer our Bargain selections. Here are some of the best deals on firearms, hardware, reloading components, and shooting accessories. Be aware that sale prices are subject to change, and once clearance inventory is sold, it’s gone for good. You snooze you lose. The LabRadar is the most advanced chronograph on the market. When it was first released, you had to wait months to get one of these Doppler Radar units. Now they are in-stock and ready to ship at Bruno Shooters Supply for $559.95. Once you learn how to position and adjust the LabRadar, you should find the machine reliable and versatile. We do recommend getting a separate battery pack. If you are considering purchasing a LabRadar Chronograph, we strongly suggest you read the very thorough and informative LabRadar Review by Ray Gross, Captain of the USA F-TR team. You won’t find a better deal on name-brand ANSI Z87.1-approved safety glasses. Choose from Pyramex, Radians, or Winchester brands on sale now at CDNN Sports. We have used Pyramex safety eyewear for years. These are lightweight, comfortable and fairly rugged. The Radians Maverick features a stylish silver frame, while the Winchester eyewear features wrap-around amber lenses. Eurooptic.com has received hundreds of brand-new Leupold VX-6 riflescopes, and will sell them at very deep discounts. Leupold’s VX-6 line spans 15 models, all with 6:1 zoom magnification ranges. From the 1-6x24mm CDS optic to the impressive 7-42x56mm Side Focus Target model, you can find a VX-6 for virtually any rifle application. And now you can save hundreds by purchasing overstock VX-6s on sale. Benchrest Matches have been won (and many records set) with 36X Weaver T-Series optics. Our friend Boyd Allen observed “You can pay three or four times as much for a scope but not necessarily be more competitive — a 36X front objective Weaver is enough to win with…” The Classic T-Series Weaver has proven to be one of the most reliable high-magnification scopes ever made. The “old-fashioned” adjustable objective works well and the Weaver Micro-Trac turret system delivers precise and repeatable elevation and windage control. Now just $369.99 at Natchez, this is a great deal. Here you go — instant varmint safari. This Hornady-made .223 Rem ammo features quality hollowpoint bullets, rather than the not-so-accurate FMJ bullets with most bulk .223 ammo. This stuff is much more accurate (with lower ES/SD) than other low-priced ammo. Users report sub-MOA accuracy with this stuff. If you’re planning a varmint safari this spring but don’t have the time (or gear) to reload, pick up a couple boxes of this stuff and you’re good to go. There are 247 rounds in each polymer ammo “can”. This ammo usually comes loaded with Hornady’s XTP (eXtreme Terminal Performance) bullets which work great on varmints. Every hand-loader needs one of these Lee Universal Shell Holder Sets. The kit contains 11 shell-holders for most popular rifle and pistol cartridge types. This editor bought one of these kits 25 years ago, and I still use it every week. It’s nice having one, compact container that has every shell-holder I need for both pistol and rifle cartridges. Even if you prefer more expensive Redding shell-holders, this 11-piece kit serves as a valuable back-up. Right now the Shell Holder Set is on sale at Amazon.com for $26.62, with free shipping for Amazon Prime members. This is quality, CCI made-in-USA ammo with reloadable, brass casings. We have used this CCI-made Blazer 9mm ammo in Sig, HK, and Glock pistols and it performed very well. This stuff won’t last long at this price (less than $0.20 per round). If you need 9mm practice ammo, order soon — this very same 1000-round case of Blazer 9mm ammo costs $60.00 more at MidwayUSA. Blazer Brass is loaded in boxer-primed, reloadable brass cases for added value. Share the post "Bargain Finder 68: AccurateShooter’s Deals of the Week"
If you’re looking for a good deer-hunting rifle at a super-affordable price, check out this .270 Winchester Ruger American. It comes with a gray-blue digital camo finish that actually suits gray fall days pretty well. The long action sits in a integral bedding block, and features a three-lug bolt with 70° bolt lift. The 22″ hammer-forged barrel has a 1:10″-twist, so it’s capable of shooting the most popular .270-caliber hunting bullets. Ammo is held in a flush-fit rotary magazine. The Ruger American is a good, solid rifle — and this is a steal at $289.99. If you don’t like the finish, buy a $5.00 can of spray paint. This is very good European-made rimfire ammo at an affordable price. SK Standard Plus is much better than most low-priced rimfire ammo. This is a good choice for cross-training, fun plinking, or rimfire tactical matches. When we don’t need ultra-high-quality Eley or Lapua match .22 LR ammo, we’re happy to shoot SK Standard Plus. The Grafs.com price includes shipping (after one flat $7.95 fee). Lee pistol dies are not expensive, but they work perfectly well for most handgun cartridges. We like the fact that Lee’s three-die sets come complete with a shell-holder and dipper. We use Lee dies ourselves for 9mm Luger and .380 ACP reloading. Right now Midsouth has a special offer — buy any pistol die set (starting at $30.56), and you get a FREE Midsouth hat (green or khaki). We recommend the 3-die carbide die sets. These include Carbide Full Length Sizing Die, Bullet Seating Die, Powder-Thru Expanding Die, Universal Shell Holder, and Powder Dipper. All the elements (dies, shell-holder, dipper) fit inside a convenient see-through plastic storage case. The RCBS Rock Chucker remains a classic — a big, strong, versatile press that can handle most reloading chores with ease. And now you can get a genuine Rock Chucker Supreme for $126.99 — a very good deal. The Rock Chucker offers plenty of leverage for case-sizing and the “O” is tall enough for long cartridges. The Rock Chucker has a very strong base and should last a lifetime. We’re not fans of the Rock Chucker’s priming system but most serious reloaders use a separate priming tool. This is a very good spotting scope for the price. Yes it gives up some low-light performance to a spotter with an 80mm objective, but otherwise it is a good performer, and we can’t think of much that will touch this Vortex Diamondback spotting scope for anywhere near the $399.99 sale price. Choose from angled or straight version for the same $399.99 price, which includes the 20-60X zoom eyepiece. Here’s a very good deal on the popular RCBS ChargeMaster combo scale/powder dispenser. This unit sells elsewhere for up to $389.00. You may want to act quickly as sale pricing changes frequently and many other vendors have recently raised their prices. Grafs.com sells this for $369.99 now while the current Amazon.com price is $296.99. You can save a lot through Natchez right now. NOTE: There is an RCBS Rebate Program in effect now — if you spend at least $300.00 on “RCBS tools and accessories” you can get $75.00 back. This is a pretty darn good folding knife, and a killer deal at under $20.00 from Amazon.com. Yes your Editor bought one. The semi-serrated stainless steel blade is sharp and holds its edge surprisingly well. The knife comes with a nylon sheath and a Bear Grylls survival guide. 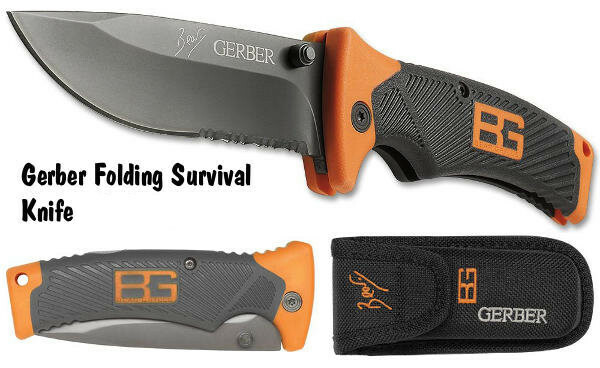 Despite its low cost, Gerber offers a lifetime warranty on this knife. Here is a verified owner’s review: “Most retailers sell it for 30 bucks. This knife is…very sturdy with no blade play and has a good solid feel. The handle is very grippy… [and] fits VERY nicely in the hand. Love Gerber’s serrations… great for cutting rope, cordage and strapping.” Note — this price has been fluctuating. There was one Amazon seller at $19.85 with Free shipping, Click link at right to see multiple price options. Share the post "Bargain Finder 57: AccurateShooter’s Deals of the Week"
Here’s a killer deal on a versatile Stocky’s Long Range Stock with aluminum V-block bedding system. For just $199.99, order this for Rem/Rem Clone long actions or short actions, with either narrow or wide (varmint/tactical) barrel channel. This would be a good choice for a varmint rifle. This is also offered with a matte black, tan, or olive baked-on textured finish for $239.99. The .45 ACP is probably our favorite centerfire pistol cartridge. It is reliable, inherently accurate, and makes big, easy-to-see holes in paper. Here’s a good deal for .45 ACP shooters. Sportsmans Outdoor Superstore is selling 300 rounds of American Eagle .45 ACP 230gr FMJ ammo for $114.95 in a handy plastic ammo can. And with factory rebate, you can knock thirty bucks off that price. Through the end of 2016, Federal Ammunition is offering $30.00 cash back on this ammo. CLICK HERE for Rebate Form. Fine Print: Maximum of $30.00 rebate. Purchase must be made before December 31, 2016. Coupon must be received by January 31, 2017. Consumer submits coupon with UPCs written and original cash register receipt and/or dated itemized sales invoice (photocopies not accepted). Please allow 6-8 weeks for delivery. Total redemptions limited to five (5) of each product per name, address and household. This is an excellent entry-level reloading kit, which is on sale for $199.99 at Natchez Shooters Supplies. We like the relatively compact Special 5 press for most reloading duties. Eventually you may want to add an additional, large heavy press, but this will get the job done. This kit includes an RCBS Powder Measure, Digital Scale, Powder Trickler, Hand Priming Tool, Load Manual, Loading Tray, and more. It’s hard to beat this combination of tools for under $200.00. With ballistics far superior to a .22 LR, the 17 HMR is ideal for Prairie Dogs and small varmints out to 180 yards or so. Now you can get a reliable, name brand 17 HMR rifle for a very attractive price. That’s right, Southern Shooters is selling the 17 HMR Ruger American Rimfire, with 22″ barrel, for just $252.63. FFL required. For other vendors with this rifle, CLICK HERE. This Federal .22 LR ammo is just 7 cents per round — the kind of pricing on bulk rimfire ammo we used to see in the “good old days”. Act quickly, this $22.99 Federal .22 LR Ammo deal won’t last long. Each box contains 325 rounds — enough ammo for many sessions at the range. The bullets are 40 grains, solid lead. For just $69.99, this Frankford Arsenal Kit provides everything you need to clean brass: Vibratory Tumbler, Rotary Media Separator, Bucket, Corn Cob Media (3 lbs. ), and Brass Polish. The Case Tumbler holds up to 600 9mm cases or 350 .223 Rem cases. The separator system is generous, with a 3.5-gallon bucket. NOTE: Sportsman’s Guide Buyers Club members can purchase for $62.99. Even if you have a good set of calipers, you may want to get one of these Neiko 01407A Digital Calipers. The #1 best-selling digital caliper on Amazon.com, this Neiko tool features a large LCD Screen and measures up to 6.0 inches. With over 2300 customer reviews, this product has earned an overall rating of 4.4 out of 5 stars. It’s hard to go wrong for $17.74, even if you just use these as a spare set for measuring group sizes and case trim lengths. Share the post "Bargain Finder 52: AccurateShooter’s Deals of the Week"
Everything you see above can be yours for just $225.00, after manufacturer’s rebate. Right now, Cabela’s is selling the Rock Chucker Supreme Master Reloading Kit for $300.00. That’s a good deal as this Reloading Kit sells elsewhere for up to $360.00. But he’s the real incentive — if you spend $300.00 on RCBS products in 2016, RCBS will send you a $75.00 rebate. That reduces your net cost to just $225.00 for the entire Kit. Need quality .22 LR rimfire ammo at an affordable price? Consider Norma. Most folks think Norma only produces centerfire ammo and cartridge brass. As a result, people haven’t been looking for Norma rimfire ammo. Their loss is your gain. Accurate, reliable Norma .22 LR ammunition is in-stock right now at leading online vendors. This is good quality ammo, made in Europe. Bullets.com has Norma Tac-22 ammo in stock at $5.25 per 50-rd box (SKU: BL7819). In addition, Bullets.com offers Norma Match-22 ammunition at $7.50 per 50-rd box (SKU: BL11887). Here’s a very good deal on the popular RCBS ChargeMaster combo scale/powder dispenser. This unit sells elsewhere for up to $389.00. You may want to act quickly as sale pricing changes frequently and many other vendors have recently raised their price on the Chargemaster. MidwayUSA sells this for $349.99 now while the current Amazon.com price is $322.99. Here is a very rugged hard case that compares well with a Pelican case, yet is less than half the cost. Plano’s new GunGuard All Weather™ 46″ gun case features heavy-duty, dual-stage lockable latches, a user-configurable foam interior, and a watertight/airtight closure with built-in pressure valve. The interior size is 43″ X 13″ X 5″, while the pluckable foam zone is 39.25″ X 10.25″. This is a very tough case that can withstand hard handling. If you have been waiting to get a Magnetospeed… wait no longer. Priced at just $179.99 at Grafs.com, the Magnetospeed Sporter model costs less than half as much as Magnetospeed’s V3 models. This chronograph attaches directly to your barrel so you don’t have to go downrange to position tripods and set up skyscreens. For most people the Sporter Model contains all the features they need. Using Magnetspeed’s XFR adapter (sold separately), data can be transferred easily from the display module to your mobile device. READ Magnetospeed Sporter Review. Share the post "Bargain Finder 34: AccurateShooter’s Deals of the Week"
At the request of our readers, we have launched a “Deals of the Week” feature. If this proves popular, we’ll try to run this every Monday. Here are some of the best deals on hardware, reloading components, and shooting accessories. Be aware that sale prices are subject to change, and once clearance inventory is sold, it’s gone for good. You snooze you lose. Two of the most sought-after (and hard-to-find) powders are now available, at least in one-pound versions. Midsouth Shooters Supply has Hodgdon Varget in one-pound containers for $23.30/pound, while Powder Valley has Hodgdon H4350 in one-pound containers for $23.25/pound. Act quickly — supplies are limited. NOTE: If these sources run out, Precision Reloading has both Varget AND H4350, priced at $29.49 for a one-pound container. 11/10/2015 Update: Midsouth has Sold Out of Varget. Precision Reloading still has it. Now can get a quality Nikon riflescope with a built-in Laser Rangefinder for no more than you’d pay for a Rangefinder by itself. That’s right, Nikon’s advanced 2.5-10x40mm M-223 LASER IRT combines a Laser Rangefinder with a full-featured scope. This is good set-up for hunting — you don’t have to carry a separate LRF. This unit offers “one-touch” activation with range values that display for 12 seconds. That makes it easy to hold your rifle with both hands while scanning. Now we’re talking — this is the kind of pricing on bulk rimfire ammo we used to see in the “good old days”. Act quickly, this Federal .22 LR Ammo deal won’t last long. Also, seller Natchez has a purchase limit: “Due to limited supplies and high demand this item has a 2-piece maximum order quantity per customer, per every 1 day.” So you may order two boxes per day, which will total 650 rounds. The bullets are 40 grains, solid lead. Bond… James Bond. If 007 were to pack a modern-day equivalent of his Walther PPK, it would be this slim new PK380 in .380 ACP. Weighing just 19.4 ounces, the slim PK380 is easy to carry. The grip is very comfortable even for small hands, and the slide is easy to operate, making this a good choice for the ladies. The PK380 has an ambidextrous manual safety and is hammer-fired. If you’re shooting a Fifty, you need lots of stability. Now there’s a big, heavy front rest designed expressly for the big .50 Caliber rifles. This new, 20″-wide cast iron rest weighs a whopping 24 pounds. Pin-to-Pin footprint is 18.9″ providing outstanding stability and resistance to rocking. The large top accepts front bags up to 8-3/4″ x 3″ (bag not included). Designed to be used either on the bench or on the ground, the new Bald Eagle Big Fifty Cast Iron Rest (Model BE1161) is available for $375.00 as an introductory special. As an end-of-year special, Creedmoor Sports has knocked $50.00 off its famous Hardback shooting coats. Choose from all-leather, leather + Cordura nylon, or all-Cordura. We personally like the Combo coat that uses leather in the arms/shoulders with nylon in the front. This saves weight and is a bit more comfortable in summer heat. Yes, you can get a name-brand Ultrasonic cleaning machine for under fifty bucks. This Hornady Lock-N-Load Sonic Cleaner, which sells elsewhere for $75-$85, is available at Brownells.com this week for just $49.99. This cleaning machine holds up to 200 .223 Remington cases, or 100 .308 Winchester cases. Once you’ve used a geared head for your spotting scope, you’ll never want to go back to standard tripod controls. The Manfrotto 410 Junior Geared Head delivers precise 3-Axis control: 360° of pan (traverse), +90° to -30° of front tilt (elevation), and +90° to -30° of lateral tilt. When spotting, this makes it much easier to traverse from one target to another — you can move horizontally with no vertical movement. AccurateShooter’s editors use this model 410, which features a quick-release plate. This is a very good deal. This same Manfrotto 410 Geared head sells elsewhere for $270.00 or more. Share the post "Bargain Finder 8: AccurateShooter’s Deals of the Week"
A reader recently asked: “Where can I get an RCBS ChargeMaster Combo at the lowest price?” We’ll we scanned the web, checking a dozen vendors. Most vendors are well over three hundred, into the $320-$340 range. Right now the best deal we found was at Natchez Shooters Supply, which sells the ChargeMaster scale/dispenser combo for just $289.99 (item RC98923). If you purchase a ChargeMaster, we recommend you add an inexpensive accessory — the handy RCBS Scale Pan with integrated Funnel (RCBS item 9090). This unique combo product allows you to transfer the powder charge directly to your cases. Now you don’t have to pick up a separate funnel, put that on the case, and then take the powder pan off the machine and pour powder in the funnel. The RCBS Scale Pan Funnel can save time. And, you avoid the possibility of a spill (or tip-over) when you pour from a normal scale pan into a separate funnel. The hood on the Scale Pan Funnel also helps to keep kernels from bouncing out of the pan when dispensing. Share the post "RCBS ChargeMaster Prices and Scale Pan Funnel"
Natchez Shooters Supplies just announced a major 3-Day SALE on big name reloading gear. Prices on high-quality RCBS, Redding, Hornady, Lyman, and MEC products have been slashed. But this sale runs for three days only — the deals expire 10/19/2014. (NOTE: we are not sure if this means end of day 10/19 or if the deals expire at 11:59 pm on 10/18 — be forewarned). Sale tip by EdLongrange. We welcome reader submissions. Share the post "Big 3-Day Sale at Natchez Shooters Supplies"
If you want the good stuff, Natchez also has Lapua .22 LR 40gr Midas+ ammo in stock at $17.99 for 50 rounds. Not cheap, but this is top-flight stuff that has won matches at the Olympics. There is no purchasing limit on this Midas+. Share the post "Natchez Has Remington and Lapua .22LR Rimfire Ammo in Stock"
If you need a riflescope at a bargain-basement price, Natchez Shooters Supply (Natchez) is running a big sale on Weaver Scopes right now. You’ll find huge savings on scopes big and small, ranging from a 1.5-4.5x24mm all the way up to an 8-32x50mm. The discounts off MSRP are really pretty remarkable. For example, a Wever 6-24x50mm Classic Extreme Scope with illuminated reticle (and 30mm tube) is now just $339.95, marked down from $579.00. (That’s a 41% price cut). The Weaver 2.5-10x56mm Classic Extreme scope, a good general-purpose 30mm-tube hunting scope, is marked way down to $299.95. Original MSRP on this scope was $926.88, and it sells elsewhere for over $550.00. Most of these scopes are discontinued models, but they still carry the normal Weaver warranty. NOTE: to find particular on-sale models, we suggest you type “Weaver” plus the scope power description in the Natchez home page search field. For example, type “Weaver 2.5-10×56″. That should bring up the item with the low sale price. Scope Sale tip from EdLongrange. We welcome reader submissions. Share the post "Big Discounts on Weaver Scopes at Natchez Shooters Supply"
Here’s good news for reloaders. Some large shipments of propellants were delivered in the last week, and we are starting to see supplies of some popular powders start to catch up to demand. Third Generation Shooting Supply received a very large order of Alliant Powders in one-pound containers, including the popular Reloder series. If you need RL15, RL19 or RL22 you may be able to grab some before it’s gone. TGSS has already sold nearly a ton of RL15 this week. Natchez Shooters Supplies is featuring Vihtavuori powders, and the Natchez inventory system is showing supplies “in stock” for many of the most popular Vihtavuori powders including N320, N133, N135, N540, N150, N160, and N165. All these powders (including 8-lb jugs of N133) are shown “in stock” as of this morning, but we caution that things change quickly! NOTE FOR LATE READERS: Inventory shown for 10:00 AM April 20, 2013. Hodgdon H1000 (8 lbs.) — In stock at $152.00 for 8 lbs. Hodgdon Superformance (8 lbs.) — In stock at $152.00 for 8 lbs. Alliant Reloder 50 (8 lbs.) — In stock at $137.50 for 8 lbs. IMR 7828 (8 lbs.) — In stock at $147.80 for 8 lbs. Editor’s Note: As with all inventory systems, there can be a variance between actual inventories and listed inventories. We are reporting what is shown “in-stock” this morning. But if the inventories are not updated in “real time” as shipments are made, true supplies may be less than what is shown. Share the post "Online Vendors Report Recent Powder Shipments"